Visual Basic .NET is a radically new version of Microsoft Visual Basic, the world's most widely used rapid application development (RAD) package. 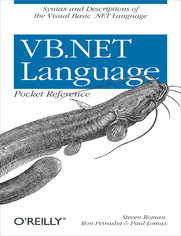 Whether you are just beginning application development with Visual Basic .NET or are already deep in code, you will appreciate just how easy and valuable the VB.NET Language Pocket Reference is.VB.NET Language Pocket Reference contains a concise description of all language elements by category. These include language elements implemented by the Visual Basic compiler, as well as all procedures and functions implemented in the Microsoft.VisualBasic namespace. Use it anytime you want to look up those pesky details of Visual Basic syntax or usage. With concise detail and no fluff, you'll want to take this book everywhere.